If Friday at the Magnesia Bank isn’t busy then we really are struggling. In time, the punters arrived, the band on stage, back in time Chicago 19 and 55. The King Bees reign supreme playing a brand of South Side Chicago blues you expect to find only in your heavenly dreams. Down the Metro line in town a singer-songwriter inexplicably held 50,000 in his thrall, ready to do it again tonight, then a third time tomorrow night. Make no mistake, the Maggie Bank is where it was at. Sonny Boy, Jimmy Rogers, Little Walter, Magic Sam…these are the guys to go hear. Yeah, they’re long gone but their music lives on thanks to many a two-bit bar room blues band. Find yourself the best blues band around and it puts things into perspective – King Bees are in a class of their own. I Don’t Know opined frontman Scott Taylor…Sonny Boy would have approved, no two ways about it. You Got Me Cuckoo protested Michael Littlefield…Little Walter would have sympathised with the man. Taylor, vocals and harmonica to die for, Littlefield, student of rhythm and blues guitar, vocals too, these guys are the business and what’s more they’re probably still the right side of thirty. King Bees’ rhythm section is an unusual beast – Simon Hedley, the senior man of the partnership does it right…he plays double bass, sidekick Giles Holt, most definitely a twenty-something, doesn’t do blues-rock, he’s cut from the Chess Records’ back catalogue…can you hear Fred Below hollerin’ and a whoopin’ in praise of the young man? Keep it to Yourself insisted Taylor/Sonny Boy, and a delirious Littlefield sang Little Walter: My baby gimme a high temperature, My baby gimme a high temperature, 101 when we kiss and dance, 102 for a night romance, 103, 4 and 5…King Bees play the occasional instrumental. First set Hideaway, second set Don’t Get Around Much Anymore, the dancers were up shaking their thing, right in front of the band, on a night that the PA couldn’t have been worse - at one point harmonica ace Taylor a tad afraid to stand close to the mic for fear of an electric shock (! ), stepping back to wail and shout on Big Walter’s Hard Hearted Woman. The band’s piano player is a frontman in the making. Dominic Hornsby rattles the 88s, straps on a guitar from time to time, sings a rollicking Kansas City, yeah, not bad at all. Michael Littlefield is a fifties’ throwback, he’s got the look, he’s got the voice, great guitar too, move on over Louis Jordan, here comes Caldonia! 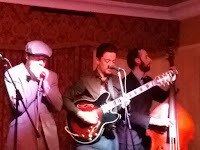 A ropey PA, distracting dancing queens, it all added up to a cracking night of Chicago blues down at the Maggie Bank. King Bees’ residency at Billy Bootleggers resumes July 6th. It’s the only one game in town.